In Italy, in five years, carmakers have lost more than 1,600 dealers, while the dealers of trucks (550 in 2009), today are only 110. Also in the ultra-efficient US there was a die-off: NADA-data shows that more than 6,500 dealers have disappeared. Whilst of the remaining 17,665 dealerships, 5,000 of them sell less than 10 new cars per month, and 7,000 fewer than 30 per month. These numbers in Europe are not tolerated by many manufacturers. If for dealers and salesmen – like in the Foreign Legion – the watchword is: “march or give up the ghost”, what’s happened on the other side of the barricade to those who build automobiles? The list of the disappeared carmakers is impressive: of the more than 170 brands existing in the world in the 80s, today only 38 remains: nearly 80% less! Saab, Simca, Oldsmobile, Triumph, NSU, Sunbeam, MG, Bristol, De Tomaso, Innocenti, Austin Healey, DAF, Hillman, American Motors, Matra, British Leyland, Volga, Morris, Zaz, Iso Rivolta, Bizzarrini even … the Trabant has been hurt by breathing the air of the “free market” after the fall of the Berlin Wall. 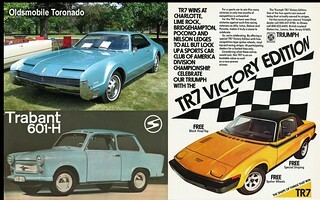 Nostalgic remembrance: who does not remember the Oldsmobile Toronado? One of the first premium car front-wheel drive, with pop-up headlights and a line “state of the art” 50 years after the launch. Oldsmobile, founded in 1897 and first to introduce the automatic transmission, wiped out with thousands of dealers by Rick Wagoner in 2004. What about the unforgettable Simca 1000? The economy car of the carmaker that has contributed to the motorization of all Europe, born thanks to Fiat in 1934, dismembered by the financial games of Chrysler in the 80s (Talbot-Matra-Simca) and passed away at the hand of PSA in 1991. 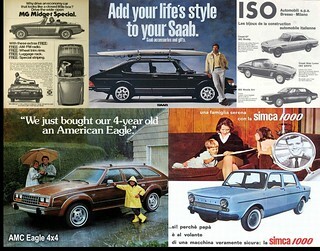 I could go on for hours: the DAF 33 with the variomatic gearbox; MG B GT; the Triumph Spitfire and TR7; the Austin Healey; the AMC Eagle – the first crossover – conceived by a carmaker with Studebaker, Packard and Hudson in its DNA, 30,000 employees, erased by Chrysler in 1988 with all its dealers! Looking into the showrooms at the end of the 70s, few persons would have bet on the success of some carmakers today highly appreciated by customers and dealers: Subaru was selling the 360 (2-cylinder, 2-stroke, 20 hp); in the showroom of the Suzuki dealer there was the Front (2-stroke, three-cylinder, 25 hp); Toyota was promoting the 800 (790cc, two-cylinder boxer, 43 hp). Whilst in the same years Alfa Romeo commercialised the Alfetta with transaxle, de Dion and DOHC engines; Fiat sell the 124 Sport designed by Boano, Renault launched the revolutionary R5, and Volkswagen surprised the market with Golf GTI. History has shown that only manufacturers who have invested in product and customer-oriented policies have been successful, while others are struggling with their dealers or no longer exists, folded up on domestic markets, without new range, with wrong commercial policies. 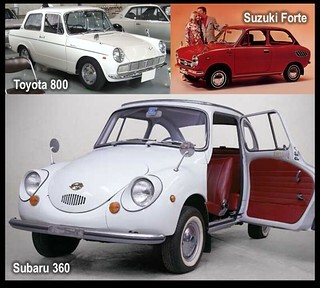 Many brands – rather than wasting resources in unprofitable markets – has decided to leave some marketplaces, abandoning the dealer networks as Suzuki in the US, or Chevrolet and Daihatsu (and Lancia within a short time) in Europe. Some others carmakers has done the reverse operation, and some brands “disappeared” in the Western markets have “reappeared” in Asia and China, where there are more than 90 local brands. Hey, here is the “new” Rover 200/300, the Buick assembled with Opel components, the MG scarcely “English styled”, or some unwatchable Lotus sold as they were peanuts. What will happen in the western marketplaces? A few manufacturers do experiments to make up for the inefficiencies of the current system: direct agents, subsidiaries, city-cyber-store, temporary shop, dealer proximity or vans for sales and service door-to-door, but also Uuber, Blablacar and remote working. Without mentioning the Internet, of which many speak pretending to know, but only a few use properly. In the meanwhile the dealers thank the carmakers and pray that their brands… resist! QNX Software Systems, the infotainment of BlackBerry at CES 2015; board system for information and driver assistance. 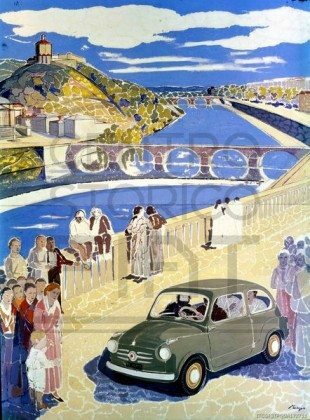 The Fiat 600 helped change Italians traditions. Mobility boundless, new possibilities for leisure time and new spaces in town.